Her favorite snake is the eastern hognose. “It actually plays dead like an opossum,” she says. Titchenell is a wildlife specialist with The Ohio State University, and on Sept. 20, she’ll share what she loves about reptiles and amphibians, including why they’re good to have as neighbors, at the annual Farm Science Review trade show near London, Ohio. Her talk, called “Common Frogs and Snakes of Ohio,” which will cover turtles, toads and salamanders too, is set for 10:30-11:30 a.m. in the Review’s Gwynne Conservation Area. The talk is free with admission to the Review, which runs from Sept. 18-20. “I want people to learn more about the lives of these secretive animals, to know their benefits, and how to encourage habitat for them around their farms,” said Titchenell, who works for Ohio State’s College of Food, Agricultural, and Environmental Sciences (CFAES), the Review’s sponsor. Titchenell said reptiles and amphibians do good around farms and gardens. 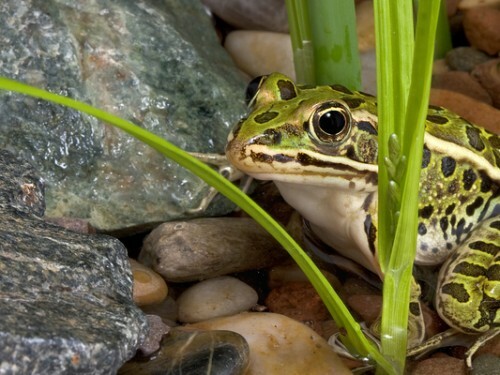 Frogs, for example, gobble up insect pests, especially around ponds. Garter snakes eat garden pests including grubs and slugs. Rat snakes wolf down mice and rats that can plague a shed or barn. Titchenell said she’ll talk about those benefits and about Ohio natives including green frogs, American toads, painted turtles and spotted salamanders. Most of them keep a low profile. Snakes can be a tough sell, she said. Some people fear them instinctively, although they don’t really need to. “I tell folks that they don’t have to love snakes or even like them, they should just appreciate their value and place in the ecosystem,” Titchenell said. In fact, the biggest threat to reptiles and amphibians is often the loss of their habitat — destruction of the places they call home, especially wetlands and woodlands. The removal of fence rows and field borders, meanwhile, plowed and planted instead, makes it harder for them to travel between the habitat that remains. Crossing roads, especially for toads and turtles, is often unfortunately deadly. “The good news is that ponds can be great habitat for reptiles and amphibians if vegetation is allowed to grow around it,” Titchenell said. The good news, too, is that several other talks in the Gwynne area will focus specifically on managing ponds. In all, the area will host several dozen free talks and demonstrations — on topics including forestry, wildlife and water quality — during the three days of the Review. The full schedule of events in the Gwynne area can be seen at go.osu.edu/CZyn. Tickets for the Review are $7 online, at participating agribusinesses and at county OSU Extension offices, and are $10 at the gate. Children 5 and under are free. Hours for the event are 8 a.m. to 5 p.m. Sept. 18-19 and 8 a.m. to 4 p.m. Sept. 20. More details on the event are at fsr.osu.edu.